Fore’s most popular product! It is a comprehensive 100 page manual that comes to your inbox in a digital format, and includes all original DOC, XLS, PPT files for you to modify yourself. You have access to personalize all of these forms for your specific needs. Don’t waste one more minute creating, spend that time coaching! 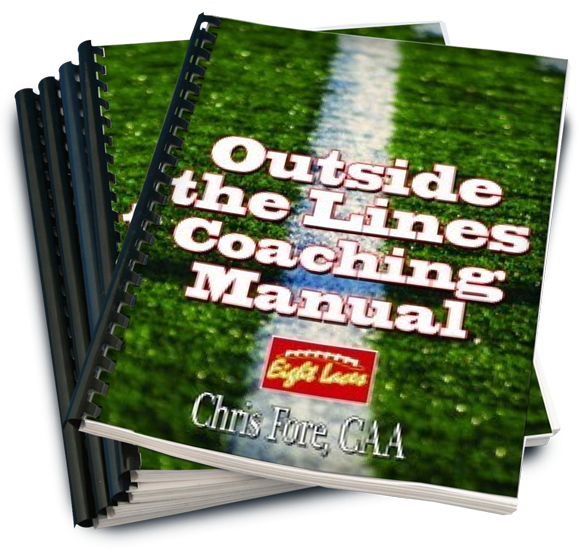 The Outside The Lines Coaching Manual has been purchased by more than 1000 coaches from all over the nation JUST LIKE YOU to save them precious time and energy! Why waste your time creating documents that are already done? A comprehensive 100 page manual is available for you in a digital format. Includes all original DOC, XLS, PPT files for you to modify yourself. You have access to personalize all of these forms for your specific needs.